A cerebral melodrama of the most steely, bare and brutal kind, 'Beyond the Hills' is the third feature from Romanian director Cristian Mungiu and his first since winning the Palme d'Or at Cannes in 2007 for '4 Months, 3 Weeks & 2 Days'. That film was set mainly in a grim hotel and explored a series of horrors suffered by two young women in late Communist Romania over just one day. The new film is contemporary – but the past hangs over it like a character just out of frame, insidious and corrupting. 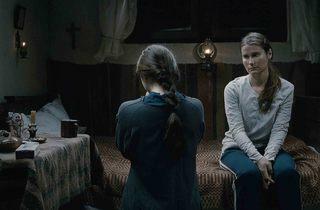 Alina (Cristina Flutur) and Voichita (Cosmina Stratan) are two young women in their mid-twenties. Old friends who grew up together in an orphanage, they reunite over a weekend. Alina has come back to Romania from Germany and wants Voichita to return with her. 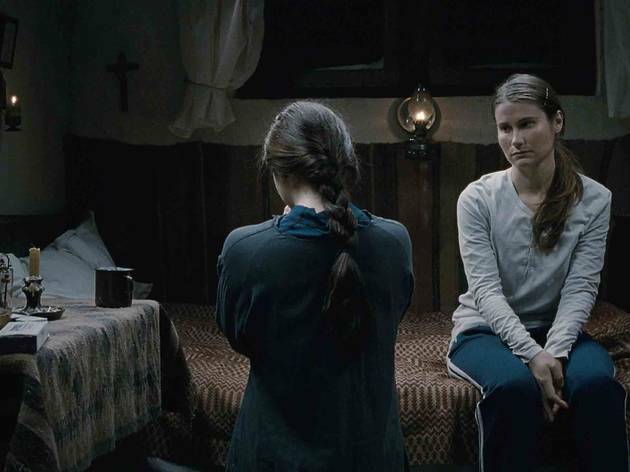 But Voichita is reluctant to leave the monastery where she lives with a dozen other women and a lone priest (Valeriu Andriuta), believing she’s found a cure for crippling loneliness, God. Mungiu embeds us in the world of her frugal, barren monastery over a few days, with Alina's presence forcing her to confront her beliefs. Meanwhile, her colleagues react with increasing hostility to the threat Alina poses to their way of life. Drawing on real events said to have taken place in a monastery in Romania in 2005, 'Beyond the Hills' allows religion to make a mockery of itself. But Mungiu's point is deadly serious, even if there are moments of black humour: in one scene the nuns produce a book listing world’s sins, exactly 464 of them; a doctor sends poor disturbed Alina back to the monastery with the instruction, 'Get her to read the scriptures, it'll help'. Mungiu's portrait of religion suggests that in the wrong hands it can not only be ridiculous but lethal. We're left to imagine the legacy Alina and Voichita carry from childhood, but there are hints everywhere. When they tell the police, while filling in some routine documents, that they lived in an orphanage as kids, the police display a casual acceptance of abuse. Voichita's brother, a marginal figure in the film, is near catatonic. Clearly the two girls formed a bond against the rest of the world as children – a bond that has now alienated them from it. Alina wishes to strengthen their relationship; Voichita hopes to replace it with faith. Mungiu's style of storytelling in 'Beyond the Hills' is more elongated and less frenetic than in '4 Months...'. This is a less immediately accessible work that buries its themes more deeply. Together, the two films make fascinating companion pieces as studies of freedom or a lack of it and, on a wider level, suggest a lingering sickness and sorrow at the heart of Romanian society.